Extensive experience in Western Wrestling, Southern Shaolin Kung Fu, Japanese and Okinawan Karate, and Kenpo. IKF & ISCF Certified Licensed Trainer. IKF &ISCF Certified Licensed Promoter. 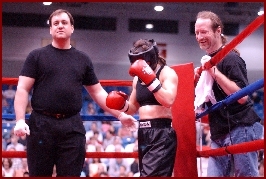 Trainer of over a dozen U.S. Champion Kickboxers. 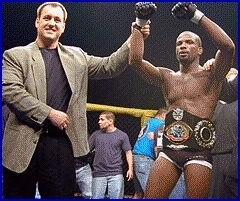 Trainer of amateur and professional competitors who have succeeded in the Ultimate Fighting Championship, No Hold Barred Events, pay-per-view boxing, and toughman contests. 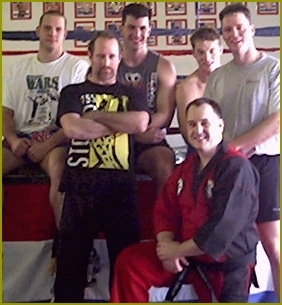 "courage, sacrifice, and dedication in showing the true spirit and integrity of the martial artist in his service to the community"
At right, Carlson, kneeling, poses with Georgia IKF Champions and other fighters after a brisk workout. "This is yet another example of the tremendous spirit of cooperation I have seen in Georgia with their promoters working together. It is also one more example of where the focus of TEAMWORK, as stressed within the IKF & ISCF organizations has proved to be the foundation of success." Steve Fossum, IKF & ISCF President. 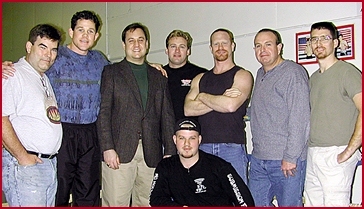 On January 19th, 2002, Georgia fight promoters (Shown above - third from left - ) gathered in Augusta Georgia for a meeting hosted by the International Kickboxing Federation and its subsidiary, the International Sport Combat Federation. The meeting was led by Mike Carlson at his Augusta Martial Arts Academy. 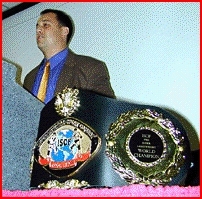 Carlson is the Assistant District Attorney known best to MMA fans as the man who got their sport sanctioned in Georgia. Also in attendance were SFO and Gauntlet Trials promoter Matthew Waller, Valdosta promoter James Corbett, Douglasville promoters Mark Maske and Mike Crocker, Atlanta Battle at the Brewery promoter Lane Collyer, Augusta's Eddie Singleton, and fighter/ISCF referee Cam McHargue. Atlanta Fight Party promoter Brett Moses also had a representative present. 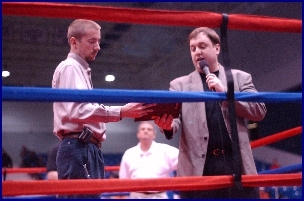 All have been associated with Kickboxing and/or MMA promotions and have supported the efforts of the IKF and ISCF to bring regulation to the fighting sports in Georgia. Since Georgia law states that MMA can take place in the state if sanctioned by the ISCF, the seemingly casual meeting was an important moment in the development of the sport in Georgia. Likewise, since Georgia is one of only a handful of states to have recognized MMA in a legal manner, the gathering will ultimately effect the entire sport of MMA in the United States. In the past, MMA in Georgia has always been a mixed bag. A multitude of promoters have run events of various sizes in the state, and, left to their own devices, very few have done a very good job. After the regulation of events began in 2001 (Georgia Legitimizes MMA Competition), Georgia went a long way towards establishing itself as a stronghold of MMA, and many promoters from around the US expressed interest in promoting in the Peach State and being legitimately sanctioned by the ISCF. Mike Carlson is tickled pink. The meeting on the 19th was for dealing with the practical matters. Events are scheduled for every month for the first, half of 2001, most of which will originate from within the state. Many other events, which are in the planning stages, do not yet have dates. The meeting established a calendar for Georgia, which allows promoters to have a reasonable time period to promote without conflicting with another event in their area. This creates a uniquely promoter friendly environment in the entire Union. No other state law creates such a situation. The meeting also established the first ISCF fighter database, which will initially be comprised of fighters who compete in and around the South. 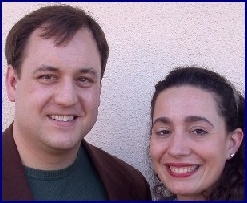 Individuals were appointed various responsibilities, such as maintaining the "Fighter Pool", and writing testing questions for judges and referees according to established ISCF and IKF rules. Because of meetings like this, Georgia and the South East USA has continued to be the most sanctioned region in the World for ISCF Events. "Unification of Champions For The Mixed Martial Arts Around The World"